The Wolverine Season One graphic novel was a lot tamer than I expected, which owes to the Salva Espin art. The art was dynamic but it was standard superhero fare that doesn't pop out.The story by the Bens, Acker and Blacker, seeked to fill the gap, just before the events of his first appearance in Incredible Hulk #181 and Giant-Sized X-Men #1.It's basically Wolverine, training to harness his ferocious animal side. He's not much removed from his running with wolves days.It was a nice attempt but if I wanted a Wolverine origin, I need not look far with Weapon X by Barry Windsor-Smith. Now that's the definitive origin story. It was ok, I guess. I liked it.Well until now I've read Wolvie's origin a thousand times, so I guess I wasn't all that excited to see his origin yet one more time. I was expecting to see something different I guess. Well its his origin, how much difference can you expect? I guess I wanted something to make it fun to read. Like Spidey's season one, I read the FCBD issue that's the first 20 pages or so, and I'm definitely buying to read Spidey's Season One sometime. It was fun EVEN though I've read Spidey's origin a couple of bazillion times. This one though, it was fun seeing classic moments like Wolvie going against Hulk and Wendigo and I guess his first costume too. But everything else, like the whole story was mediocre.The artwork is nice. I really liked the expressions of the characters the most, and the action scenes as well.And the ending was something I expected it to be, and I guess everyone who knows wolvie's origin stuff will too, but I wanted it to be handled better than that. The best way I can describe Marvel's "Season One" series of graphic novels is "cinematic". The plot is fast-paced and self-contained, the action is plentiful, and the dialogue is dramatic. There are no deep philosophical themes to be found here, or any of the other elements that made classics out of "Watchmen" and "The Dark Knight Returns". Even Wolverine comes off as less of an anti-hero, and more of an amnesiac do-gooder. As such, I'd recommend this to new and younger readers, or to anyone looking for a quick and easy introduction to Wolverine. If you're a die-hard fan of Wolverine, a collector of old-school comics, or someone looking for a darker, deeper or more immersive read, this may not be the book for you. That's not to say there's nothing here for people who are more familiar with Marvel Comics, myself included. "Wolverine: Season One" is essentially a retelling of the character's first appearance in "The Incredible Hulk" #180-181, in which Wolverine is discovered by James Hudson (Alpha Force's Guardian) and his wife, Heather, and then tasked with hunting down and capturing Hulk and Wendigo. Various events in the story trigger flashbacks to World War II, where Logan fought alongside Sabretooth, and the Weapon X Program. 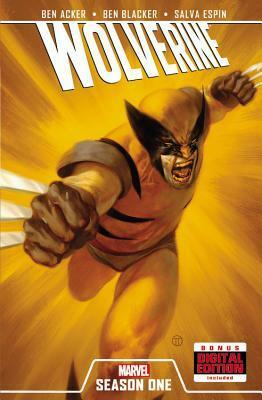 Keen-eyed readers will enjoy cameos by Captain America, Deadpool, and Alpha Force, among others, and shout-outs to Iron Man, Professor X, and the Avengers; the shared continuity between "Season One" graphic novels has always been a highlight for me.Where "Wolverine" falls short, however, is in the dialogue. As I stated above, it is definitely dramatic. Expect lots of clichés and painfully obvious statements. The underlying theme here is Wolverine's struggle to tame the "animal" inside him, and I swear, every character makes reference to this once every few pages. It does get grating after a while. I was also rather put off by some inconsistent characterization, namely Wolverine's sudden desire to help Wendigo rather than fight him, and the relationship between James and Heather - one minute they're in a loving embrace, the next she's shooting at him and he blows up a car in anger. "Wolverine: Season One" is a quick and easy read, and serves as a much better introduction to Logan than "X-Men Origins". It reminds me somewhat of the Silver Age of comics, a simpler time when the emphasis was on fun and spectacle, rather than brooding heroes and adult themes. This book is definitely not for everyone, but I'd personally love to see a "Season Two" after Wolverine has joined the X-Men. The story seemed a bit cheesy and kind of primitive, but I enjoyed it. The novel made me laugh out loud a couple of times (and that gives it an extra star) and the drawings were good as well. Probably, if the book wouldn't have such definite good-evil separation (scientists want experiments no matter what, they don't care about lives, just the 'greater good', which is not always that great... the usual stuff), I would have liked it a lot better. There is nothing more I love than an origin story but this one missed the mark for me. It was good to have it based in Canada with references to Alpha Flight and the Weapon X program but it was pretty boring. An interesting read for die-hard Wolverine fans; the first section follows the plot of Incredible Hulk #181 pretty closely, giving the background story for why Wolverine got involved in the fight. It might be a bit hard to catch all the references if you haven't read the various Wolverine origin stories, but it stands pretty solidly as a story on its own.The best part is this early section, because it sets up the relationship between Logan and the Hudsons really well. The Guardian is a tool, as always, but he's a well-written and believable tool. And I love the way Heather is written and drawn.The second section is not so great; Sabretooth joins the story, helping out Department H against Wolverine and the Wendigo. The fallout is predictable and the dialogue is fairly mediocre. I was also a bit disappointed in the ending, where Wolverine meets Professor X for the first time; I felt this was a rushed, and was a missed opportunity to start working on the very complex these characters end up developing in the Claremont run of Uncanny X-Men.The graphic novel also includes an issue of the Jason Aaron-penned Wolverine and the X-Men book (#25); this is a great book, but it's a bit unsatisfying reading only the first issue of a story that ran for multiple issues. I guess it's supposed to encourage you to buy more Wolverine and the X-Men, which, to be fair, is worth it.I love Salva Espin's art; he gets the classic feel of the 70s books while still giving his own take on it. Overall, this is a great introduction to the character of Wolverine with a lot of fan service for long-time readers. I wasn't sure what I'd be getting into with Wolverine: Season One. Thankfully, I know about Wolverine and his mutation, and how he came to be 'Wolverine' and his involvement with the X-Men (in the films, at least) etc. I feel without a lot of that knowledge I'd have been left stranding, as this graphic novel wastes no time in jumping straight into things.The story was interesting and I did like the majority of the characters. I didn't really care for the Hulk in this, but then I generally have no interest in him anyway. I did, however, like the Wendigo and how the fight with it led Wolverine to James and Heather.The art was okay. I liked the colouring of things but I wasn't keen on how Wolverine himself was drawn. I understand that he was starting out more animal than man in this volume and I felt that the way he was drawn reflected that, but I didn't like the style, personally. Overall, though, there was talent in the art so I can't complain too much, and it didn't detract or put me off from the story.That being said, I did like Wolverine as a character and the way he acted. I found it realistic, given the situation, and I just generally like him as a character anyway.All in all, I did enjoy this first volume and will carry on with any more that follow it. This was a pretty good first comic book experience. My friend purposely got me the Wolverine one since I consider him to be my favorite superhero, so I already liked the character and that made me more interested in the story. Also, as an artist, I loveloveLOVE the artwork done by Salvador Espin. And, I also love how it allows you to access a digital version of the story online. The purpose of the Season One books is to reach out to a newer/first time audience by providing them with basically a one-shot origin story, and as a first time comic book reader I believe this story did it’s job well. I could really rate this between 2 and 4 stars and feel comfortable with my decision.This is a story for newbies really. That's why it gets four stars. It does what it is trying to do.The art is fun and dynamic. I really only recommend if you haven't ever read a Wolverine comic and want to, or you've read them all and want something new. Non ci siamo.Si trattava di esperimento, non è andato bene.I disegni del povero Espin sarebbero anche interessanti per una storia grottesca e/o umoristica.Ma Acker e Blacker invece hanno scritto solo una storia trascurabilissima, di zero interesse, che nulla aggiunge al mito originale e ai personaggi. Great story, the best graphic novel I've read in months. I love the re-imagining of wolverine. I love the setting of the canadian wilderness and the struggle that Logan has between his humanity and his animal nature, in the background of having lots of gaps in his memory. okay so the art evens out and the characterization improves but it never feels like s proper Wolverine comic. I do like that they tried to make it relatively clean and the colours pop, but this feels like a sanitized retread of better stories. Not thrilled with throwing in the beginning of an arc in Wolverine and the X-Men and then walking away from it and telling me to read another comic.Retelling of classic Wolverine stories. But I prefer the originals. This was nothing special, but an enjoyable Wolverine tale all the same. Though, for being such a wild animal he seemed oddly agreeable to everything put before him. This was ok as a goofy diversionary read. Seems like the more Wolverine books there are the worse they get....Is this a cosmic law? Solid intro to Wolverine. And another thing. I'd tell you what that thing was, but that'd give away the story. A great portrayal of Wolverine's history. A fresh, but true to the past, interpretation of the characters. Heather Hudson is the best! This book wasn't nearly as good as the Dr. Strange season one book but it wasn't terrible either. I really wanted to like this revisit to Wolverine's origins, but oversimplified storytelling, dull characters and a facile waste of great subject matter left me very disappointed. Pretty poor art overall and booooooring. I'm not sure why we even needed another story like this. I did it! I finally found a Season One book that I liked! It never quite reaches the emotional standards it could, Wolverine: Season One is a fun read that contains some pretty entertaining action scenes.